Another night, another curry. I fully intended on making a wholesome salad tonight. I asked the other half what he felt like and he announced “Asian and spicy”. Not taking much persuasion I chose this curry recipe. I adapted the original quite a bit as I felt it wasn’t going to have any heat. The result has a nice zingy finish without being too hot. 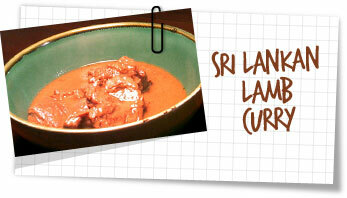 The texture to this curry is particularly nice too – a glossy clean sauce with an amazing colour. Very rich and extremely flavourful. Mix together all the marinade ingredients and mix into the lamb. Leave covered in the fridge for 1 hour. Heat the oil in a large pan over a moderate heat until hot. Add the fenugreek seeds and sizzle for 10 seconds. Tip in the onions and curry leaves and fry for 5 minutes until soft and golden. Add the paprika, curry powder, chilli powder, lemon grass, cloves, cardamom and cinnamon and stir for 1-2 minutes. Add the meat and marinade and stir carefully for 3-4 minutes to avoid sticking. Turn up the heat to high and add 1/4 of the stock. Let it simmer vigourously for 6-7 minutes until the stock is almost gone stirring regularly. Add another 1/4 of the stock and repeat the process. Then add the remaining stock and the fresh chillies and bring to a boil. Reduce the heat to low and simmer gently for 1 hour until the lamb is tender. Add the coconut milk and a little water and simmer for 7 minutes. Remove from the heat, fish out the cinnamon, lemon grass and chillies and adjust the seasoning to your taste. The beef stock may already be salty so be careful not to add too much extra. Sprinkle with fresh coriander leaves and serve with fluffy white basmati.